The question is this: Does anyone know how do the interiors get finished if you were going to put walls/ceilings in them? “The purpose of those kinds of buildings is cheap clear span space. I would leave it an open floor plan for flexibility with a small fixed utility core at one low side for heat, water, electric, gas, etc., and bundle my bath, utility and kitchen there. If it had the height, I would build a sleeping loft in the center section with a dome shaped skylight. Dining below, adjacent to the kitchen etc. 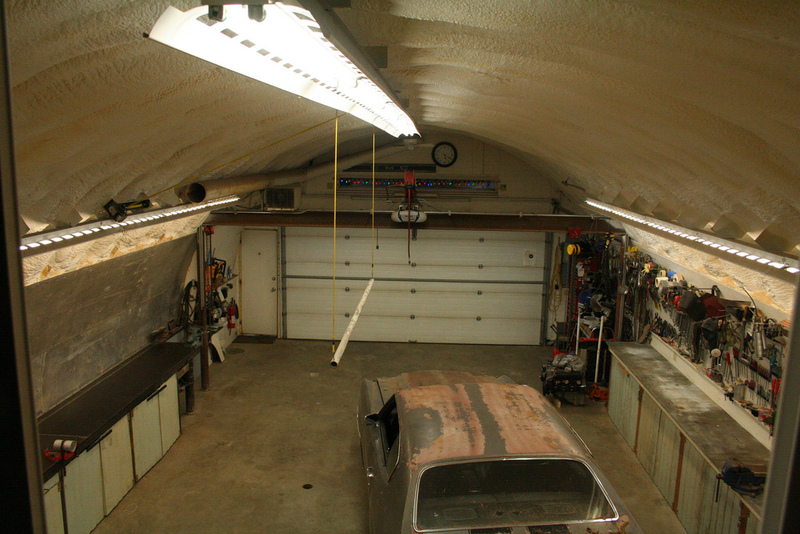 Spray foam insulation left natural, covering up conduit runs to suspended pendant lights. Exposed duct work run along the floor/wall junction. Row of ceiling fans at the apex. Cheap and easy to build and very changeable in use. BIG doors on both ends for access. I’m thinking a pair of doors like a hangar has, that open the entire end of the building. The ends of the space could be living (With big glass panels in those doors), on one end. 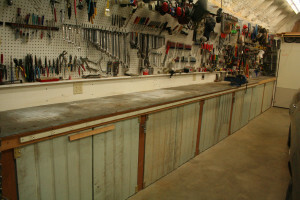 Shop, garage and storage in the other. Partitioning off too many spaces and dropping a finished ceiling just builds a building within a building. Pointless for this form. I might try to get some windows or skylights along the sides to bring light in and avoid the cave feeling. “I’ve always dug their style–’40s/’50s utility/war surplus type stuff… especially when used as auto repair shops and garages. The idea is to have one put up, and put a 2-story apartment in one end, and build race cars and hot rods in the rest of it. Living area downstairs (kitchen, living room, office) and bedroom upstairs. If I could get one fairly cheap, in the 100-foot long range, that’d be perfect for me.